In August 2003, I brought a lifelong dream to life. This is to share the many items I have collected during the last half a century, with researchers, scholars, colleagues, and the general public. I opened the International Cryptozoology Museum in a house I bought in Portland, Maine, under the spotlight of the media (see below), with a beginning trickle of invited visitors. The museum is modestly beginning with sculptures and paintings created just for it, hundreds of CZ toys and souvenirs from around the world, one-of-a-kind artifacts, a life-size, 8 feet tall Bigfoot representation, a full-scale, six-foot-long thousand dollar coelacanth model, 100 Bigfoot, Yeti, Yowie, and other footcasts, fakes like jackalopes, Feejee Mermaid & furred trout, along with such Hollywood cryptid-related props as The Mothman Prophecies' Point Pleasant "police" outfit, the movie P. T. Barnum's authentic 3+ feet tall Feejee Mermaid, the TV series Freakylinks' 22 foot wide "Thunderbird", and some of Magnolia's falling frogs. Special art and sculpture creations by some of the leading cryptozoological artists in the world are featured. Special Thanks and Wish List: The International Cryptozoology Museum in Portland, Maine, includes exhibits on the discoveries of "living fossils," the successful cryptozoological stories. One of the most famous, of course, is the coelacanth. Many thanks to an anonymous individual who has donated a full 57-inch replica mount of coelacanth as produced by Fantastic Fish Mounts. Also, appreciation to an anonymous contributor for the Gigantopithecus skull; Caleb and Malcolm for the sabertoothed tiger skull; Richard Noll, Zack Clothier, David Bittner, Todd Lester, Paul Cropper, Dean Harrison, Richard Brown, and others for track casts; and Dolores Phelps for many cryptozoo items representing the cultural impact of cryptozoology. There are many other "things" needed. If you are interested in donating to the Cryptozoology Museum, we are always looking for new material, from native artifacts and taxidermy mounts that apply, to cryptid specific exhibits and cryptozoological souvenirs. 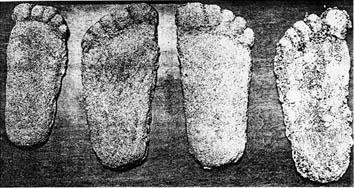 Wanted plaster casts of footprints, especially from the East and internationally taken. Please use the address below. Have an exhibit with your name on it - as the source of the donated item. Stay tuned for future details. In the spirit of cooperation, the following is posted in the hopes that people with valuable Bigfoot cast and footprint photograph information will forward it to Dr. Jeff Meldrum, Associate Professor of Anatomy and Anthropology, Idaho State University, and Affiliate Curator of Vertebrate Paleontology, Idaho Museum of Natural History. 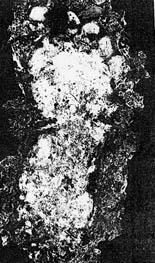 Meldrum is convinced that there is a tremendous untapped source of information to be realized in the form of photographs and casts of footprints discovered by various individuals which have never been reported to or examined by a researcher such as Meldrum. The assistance of readers is requested in locating and contributing to this data set and thereby participating in and furthering his investigation. If you have in your possession, or know of an acquaintance or relative who has original photographs or casts of footprints, please contact Dr. Jeff Meldrum at your earliest convenience. Furthermore, original newpaper photographs of casts and prints (such as those shown here) would be useful as well. Meldrum has a number of poorly photocopied clippings that have significant pictures of casts, but in their present state are not extremely helpful. He is hoping to increase his files in this regard, and assistance would be appreciated. An important arena of research is occurring regarding the collection and testing of hair samples, especially from Bigfoot/Sasquatch. The focus of such testing is now on the acceptance of such hair samples for morphological examination through the efforts of Dr. W. Henner Fahrenbach. Dr. Fahrenbach welcomes any samples, especially since the presumptive positive ones broaden his regional database. DNA analysis on Sasquatch hairs (all of which appear to look congruous from all different sites) has come to a halt since the extracted DNA, even from fresh roots, turns out to be so fragmented that no sequencing can be accomplished. However, the morphology is the precursor to any other analysis, and the greater the sampling the broader the foundation of the database. Hair samples should be sent to the below address in a plastic baggie in a normal envelope. Expensive and fast mailing procedures are superfluous and unnecessary. Please label the sample clearly with the date of collection, location of collection, name and address of the collector and/or field investigator. The "Mystery Civil War Pterodactyl"
An internet rumor began in the late 1990s that this photograph was found squeezed between the pages of a 1970s paranormal book purchased at a thrift store. For years, Forteans had searched for the exclusive "Thunderbird" photograph seen and remembered by zoologist Ivan T. Sanderson during the 1960s. Then, this newly discovered picture raised the question of its relationship to the Sanderson "lost Thunderbird photo." But something seemed wrong. The Sanderson stories told of a Thunderbird tacked to the side of a barn in Tombstone, Arizona, or some other location in the Old West. 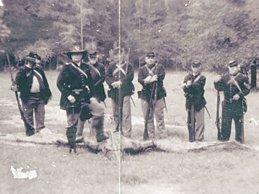 The photograph shown here, however, appeared to have captured a group of Civil War soldiers, circa 1860s, with the remains of a pterodactyl. Was this the long lost photograph, remembered by so many, but never found after decades of looking for it? As it turned out this photograph was a promotional tool of Orlando, Florida's Haxan Production (producers of "The Blair Witch Project"), to develop interest in their forthcoming fictional program, "Freaky Links." The series, first broadcast on Fox TV, finally in 2000, involved the character "Derek Barnes," an investigator of the unknown. The picture was a hoax and the pterodactyl was a prop created exclusively for two episodes of Freaky Links. Fox is done with the prop, however, and this intriguing pseudo-cryptid was acquired by Loren Coleman, and is now part of the collection of the Museum--that is all 22 feet by 11 feet of it. 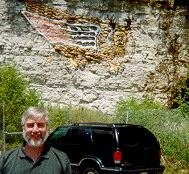 Photograph used with permission of Gregg Hale, Executive Director, Haxan Productions. Credit, Fox TV.